In her mind, she heard a cold voice whisper from the depths of a nightmare: "Thou art Famine." She stared at her plate. "Excuse me," she said, then stumbled off to the ladies' room to vomit. Tammy would have been proud. 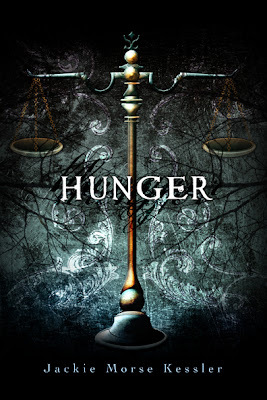 Hunger is book one in the Riders of the Apocalypse series by Jackie Morse Kessler. It is one of the most intersting mythologys I've read in a while. The idea that these teens with problems are tapped by Death himself to become on of the riders is fantastic! I loved Hunger so much. Lisa was such an interesting protagonist, and I loved the insight that Kessler created to these scary biblical figures, creating dimensions. The second book in the series is Rage (can you guess which rider that one is about? ), and it is on my shelf waiting for me to read it.